A creamy orange delight to warm the winter nights. 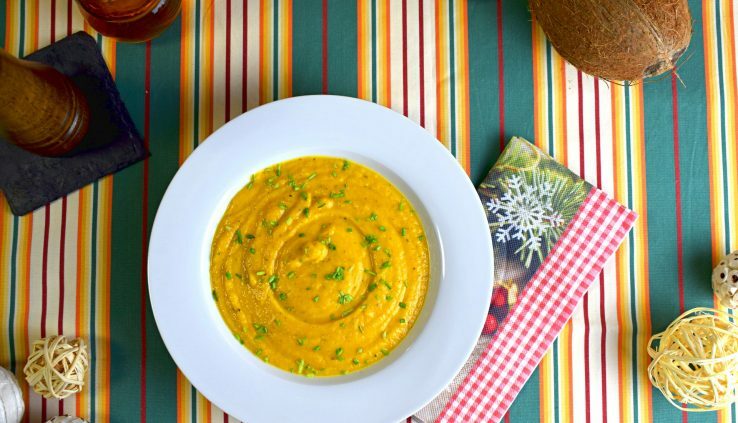 The season of squash is the right time to make a mild, yet full-bodied, bowl of savoury soup. This is an easy recipe: cut, roast, blend, and enjoy. Of all the yummy varieties of squash, I prefer butternut. This recipe, like most squash recipes, should work fine with your favourite, be it delicata, red kuri, calabaza, or even our beloved pumpkin. Be careful of ones with thicker skins, they might need a few more minutes in the oven. Stick with the sweet, full-bodied ones — please don’t shame us by using something crazy like zucchini! If you double, or triple, the quantity of this soup you’ll also need to leave it in the oven longer. Something about physics and heat distribution I’m told. I may have told myself, actually. I’ve written it on my todo list to figure out precisely why it’d take longer to roast, even if only 5-10 minutes more. It’s spread out well, and the volume is small compared to the oven, so I’m not sure why it takes any longer. Please feel free to share scientific knowledge in the comments. Be careful when pouring the juices from the tray to the pot. It’s all still quite hot when it comes out. If you’re feeling uncertain of that, just leave it. You can add it later when cold, then warm it up. Or add some more oil and spices to the pot directly.